Obituary for Diane Grace Mancor | Providence Funeral Homes & Crematorium Inc.
Mancor, Diane Grace (nee Brooks) of Haven Hill Residence October 18, 1932- August 22, 2018. 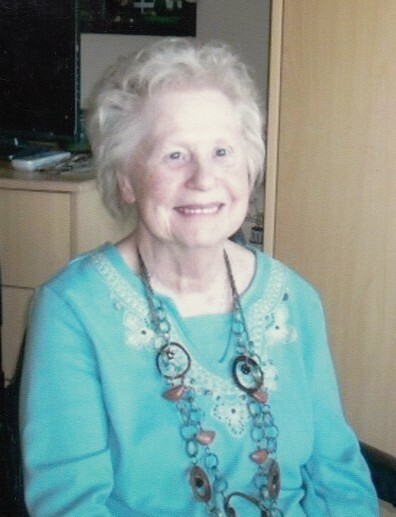 Died peacefully surrounded by her family and the caring staff of Haven Hill. The last twenty years of Diane’s life have been marked by the stroke which devastated her. Even so her graciousness and loving nature shone brightly for all who knew her and she was deeply loved by those who cared for her. But before her stroke, Diane had a full and active life: she was a vibrant, energetic and loving woman with many interests she pursued. She expressed her creativity in craft and in creating a welcoming and gracious home. She was active in the Anglican Church and her faith was a core part of her life. But above all she was devoted to her family: to her husband Jack, her children Paul, Leslie and Neil, her children-in-law Dianna, Len and Kerstin, her grandchildren and their families Scott (Jess), Kyle (Kate), Amy (Scott), Lyndsey (Randy), Jonathan and Eden and her great-grandchildren Darian and Solace. For her children Diane will always be remembered as a mother who loved caring for her family and cherished her children, providing a nurturing and supportive home life. She was, quite simply, the centre of our lives who provided wise and loving support throughout our growing up and into adulthood. She was an active grandmother remembered as caring, fun and adventurous by her grandchildren. She loved us all uniquely and never lost her sense of fun or spirit of adventure. Born in Victoria to Basil and Grace Brooks, Diane grew up in Marpole and spent much of her married life living in Kerrisdale, Vancouver, where she was a devoted member St Faith’s Anglican Church. She created an elegant household marked by the warmth of her hospitality and entertaining. A gourmet cook, all who came to her house were met with the same stylish graciousness that made it all seem so effortless. At the core of her being was her faith in Christ which sustained her throughout the many joys and occasional trials of life. She lived her life surrendered to God, never more so than in her latter years. Through it all, God was ever faithful to her. We would like to thank members of St Saviours Anglican Church who faithfully visited her down the years. We would also wish to recognize Dr David Paisley and the nurses and care aides at Haven Hill who so faithfully and lovingly tended to her right to the end and surrounded her with support and love. Her extended family wish to acknowledge the devoted care of Leslie and Len Todoruk in daily caring for her and express our deepest appreciation. In lieu of flowers donations to St Saviours Anglican Church or Penticton Vineyard Church. Service to be held on Friday, 28 September, 2pm at Providence Funeral Homes, 1258 Main Street, Penticton.